The generous support by the Graduate School of Geosciences enabled me to participate in not just one but actually two conferences. The 15th Conference on Cloud Physics and 15th Conference on Atmospheric Radiation were organized on behalf of the American Meteorological Society. The two conferences were organized jointly with one track for each. Overlapping topics were covered in four joint session, for which both lecture halls were merged. All session together, about 200 talks were given and 300 posters presented. The combination of both conference is great because many more topics than those presented in the joint session fit to both conference scopes. Returning topics were ice particles under all aspects from simulations of a single falling particle to electro-magnetic scatter attributes, aerosol cloud interactions, stratus clouds over the Southern Ocean, and effects of biomass-burning on clouds over the South East Atlantic Ocean. 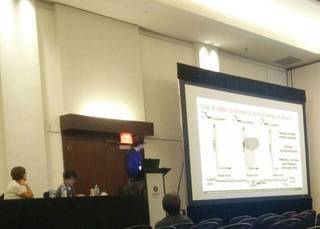 My talk was in the joint session on Thursday afternoon. My topic was not among the frequent topics, but with its focus on the observation of liquid clouds, it was a good opportunity to demonstrate the fine-scale remote sensing observations, that we collected using the HALO research aircraft. A method similar to ours was applied in a talk the day before to space-born observations. This overlap established me a contact to a experienced remote sensing scientist. In general, the conference had a pleasant size, to make and keep contact with kind people in my field. Especially the two poster sessions were intensive and exhausting, but I would consider presenting a poster on my next conference, because I think a poster enables more direct intensive exchange of ones work.